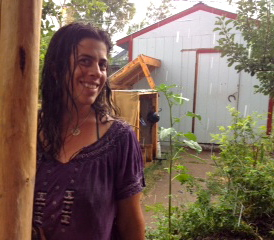 Manna from motherfreaking heaven captured on my mom’s iphone – can you see those streaks of wetness falling from the sky? Great photo! Your mom really captured your joy!! You and Rose look so much alike! And YIPPEEEEEEE for rain! I’ll second the Yippeee for rain. I grew up about 10 miles from the Waldo Canyon fire, and, although I don’t live there anymore, I have been watching friends suffer through it. So glad the area is finally seeing rain. Please send some our way! It has been nearly 4 weeks since we’ve had rain and it is looking very dry out there! Praise that rain, coming down on our heads. Love thinking of you down in New Mexico getting drenched in the same rain patterns! Love love love! And here’s to more where that came from. It’s pouring here in Denver. Rain, Rain, blessed Rain!!!! Yeah! We had rain all day (ALL DAY) Thursday, the first since May. But now back to sun-bleached forecasts. hi there :) nothing like a good rain dance. i love the smell and taste of rain, no other water can cleanse like rain can. The rain has been such a blessing all over our beautiful state, and it feels great to know that perhaps we are past the worst of the season. and the viewers are really sharing gpod thoughts.